In the Spirit of Frank Lloyd Wright� Curvilinear patterns dance with lines of energy that feel right at home on this bent glass crescent. Its graceful curve appears as a gentle wing of glass lifting us higher toward our goals and aspirations. Wing Song creates a mood of effortless flight - a song of joy that celebrates and lifts our spirits. It is one of Susan Lockhart's finest works and an unmistakable product of the Taliesin Studio founded by Frank Lloyd Wright. For aesthetics, logos and award inscriptions are placed only as shown. 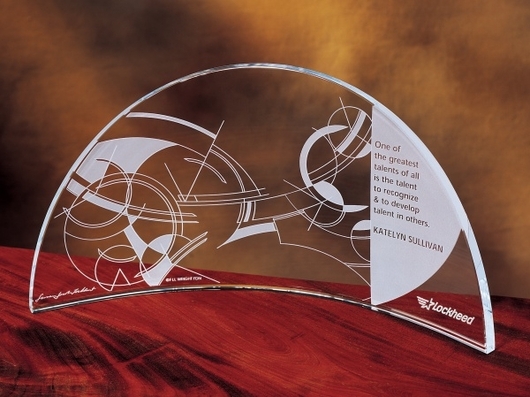 Each award is signed by the artist, Susan Jacobs Lockhart, and a $10 contribution will be made to the Frank Lloyd Wright School of Architecture on behalf of your purchase. A romance booklet about this award and your donation is included for your presentation.